The Orthopedic Jamison Dog Bed is designed to alleviate pressure points and joint pain, offering your weary friend a quality night’s slumber after a long day’s play. Great Bed Once You Put A 3 sided zipper in. I've purchased 2 of these a few years ago. They work well for my animals and I'm pleased with the moisture barrier. As with the previous 2 beds, I had to take them in for alteration putting in zippers covering 3 sides. Having to frequently launder, I struggled putting them back together. The advertising says it's easy, but it's not..particularly for older people. You shouldn't have to fight the bed. So glad we bought two! Both dogs love their beds, glad my husband talked me into getting 2 identical ones at once so they didn't argue over who got the new bed. It doesn't flatten and holds its shape even when our 92 pound dog lays on it. Arrived FAST! I bought this bed for my 11 year old German Shepard with hip and joint pain. She had been sleeping on another orthopedic bed for the past two years but it was too thick for her to navigate any longer.As soon as I got it out of the box, she walked right over and was able to lay down. Her full body is now supported and I can tell a huge difference in her comfort level. I would absolutely recommend this bed, especially for older dogs. Just the right height and right amount of support! Thanks for an amazing product! My 9 year old boxer bulldog took to it immediately. The quilted cover adds extra support to the foam inside. However, it is a bit cumbersome when putting back on after washing. It did wash well, no changes after washing. I can see this bed lasting a long time. Quality bed, definitely recommend! I have recently purchased a Kong dog bed for my 110 English Lab. He is super hard on everything. He hated that bed. I felt like I was punishing him using it so I gave up. I tried this one and he loved it right out of the box. Could not wait to lay on it. Sleeps on it every night and it holds up to his size and weight without sagging or anything. Overall, glad I bought it for him. Received this Orthopedic dog bed. It's covering is really good, and the bed itself is what I was wanting for my dog. It gives great support and is of high quality. I would recommend this bed to anyone looking for an orthopedic bed for their dog. My oldest dog is a 14 years old pug. He has had rear end paralysis since he was 1 year old. In the past year he has developed arthritis in his front leg, so he is not longer "self mobile". He has trouble sleeping because he just can't maneuver himself into a comfortable position. I have been searching and researching orthopedic beds for dogs for awhile. I liked what I read about the Jamison bed so I thought I would try it. My dog sleeps like a baby on this bed!!!! He seems so much more comfortable and moves around very little. I would recommend this bed to anyone. Think this is a good orthopedic bed for our 85 lbs. lab. He hasn't really used it alot yet since he got it as a Christmas gift. So far, a GREAT bed! Bought this for me 12 yr old Lab/Boxer mix. He is about 92-93 lbs. and it is still a large bed. He loves it! Took him less than 3 minutes to lay down on it and he will usually go upstairs a couple hours before I do, just to lay on it. Highly recommmend. We have 2 labradoodles at home, 70 and 85lbs each. One of our "dudes" loves to destroy beds in the middle of the night. The other, who has arthritis, needs a good quality bed to sleep on. This one has worked excellently for both dogs. They both love the comfort, and "the destroyer" has not yet found this bed tasty enough to eviscerate after 3 months. Our older dog with arthritis took to the bed immediately so I have bought 3 more in the medium size to put next to our beds, and in our den, so he has more options. The large size is Huge!! More for a St .Bernard size dog.Also, we have a nice home, and this bed fits in well with the decor. Nice fabric, seems to be of higher quality than the average dog bed, and doesn't cost an arm-and a leg in case "the destroyer" decides to chew.Highly recommend!! I've had this style bed before. I now have a 17 year old dog who is totally incontinent and unable to walk. She seems more comfortable on the orthopedic pillow than on the memory foam. I had my other pillows modified with a 3 sided zipper. This takes care of the difficulty putting the cover back on after laundering. I ordered the chocolate colored bed. It's dark brown. I chose the Jamison bed because LOOK how many Grrr...8 reviews it got! Pretty much everybody commented on the TOP QUALITY of the outer cover, plus the comfort to the dogs who are suffering from orthopedic problems. My schnauzer hasn't been able to walk too well lately. I want this for him because of the GOOD reviews on this website. 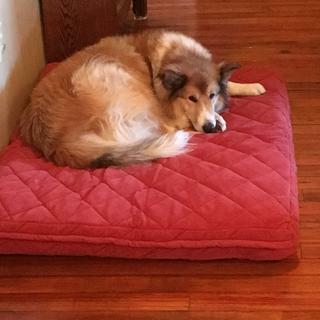 Have been looking for a large, well-reviewed orthopedic dog bed... in red. This one fit the bill and at less cost (at least on Dog dot com) than similar beds. We'll see how it holds up. Need good orthopedic support for my two aging dogs. I am optimistic that the Jamison Dog Beds will help my dogs to rest better. I needed a new bed that was orthopedic for my dog, she's a rottweiler. My dog loved this, well made. She likes to root so I throw her blanket on top and add a pillow. My SON'S puppy loved the bed too, so this is to replace my original bed. Well worth the price. I have Great Danes that LOVE this bed. It provides great support for their hips & legs. I have ordered 3 of these beds, they all are holding up GREAT!!! The cover washes up well and does not lose it's shape. AWESOME product. I purchased one a month ago and my older Great Dane loves it. I need a second one for my other Great Dane. This bed looks like it will be a good fit for my senior dog (my fur baby)! It's just the right size and hopefully will be awesome for his comfort of his aging body. Looking for a good orthopedic bed for my Pug with hip dysplasia especially when she is being kenneled. For the comfort of my 2 middle aged Cocker Spaniels. My dog is getting older and she does not jumping up on things like she used to. She love sleeping in our bed but she cant jump up any more. We thought buying this orthopedic bed will help. BEST ANSWER: Hello, this item is made with Orthopedic foam. This is not the same as memory foam. Can you remove and wash the cover? Hello! Yes the cover is removable for washing. How thick is this item? BEST ANSWER: This bed is about 5" thick. It's well made and it's shape (and padding inside) stays firm. My dog loves it. I add a blanket because my dog likes to root! And a pillow. I'm very pleased with it. Very comfy! 4 inches thick. It works well with my 60 pound, 15-year-old collie mix, who needed an orthopedic bed. 4 inches thick with padded water proof cover. a great buy. likes to arrange and snuggle in and I do wash those every other week or so. Yes. The inner mattress is egg carton style foam. The cover is a study washable material ( unsure what it's made of). You need to line dry the cover. It does not slide on/off the foam easily but it's doable and the cover holds up to gentle or regular wash. Yes, I have washed mine and it held up well. No change after washing. Best cover I have had. It is a little cumbersome to get back on but, is worth it. The cover is padded and well made. My dogs love it. Yes, the cover is washable; however, be aware it takes two people to take it off and put it back on. It is worth all the effort! Just ask my 10 year old German Shepherd! Yes. However, bear in mind that "orthopedic" is just a filler word. The interior padding is hardly anything exceeding the quality of normal foam. yes, you can take it off and throw it in the washer and dryer. It is a REAL pain to get back on, but it can be done and works fine. Yes, it is washable. It is the best bed we have had for this dog. He is 110 pounds and loves it. It is keeping its shape too. Yes...we were able to wash the cover. No issues with washing the cover. Yes. It is easily removed, washed and goes back on smoothly. Yes, but difficult to get off.sticks to foam snugly . Yes it is. A great bed and this is a great price! Does this bed have a inside waterproof cover protecting the foam? BEST ANSWER: Yes, there is a waterproof lining on the top side of the bed( on the inside - sewn inside a black lining) . So you have to be careful to lay it on the floor right side up. It has a water resistant (not sure that it is waterproof) layer on the inside top of the cover. It is not a separate inside waterproof cover over the whole bed. No it does not. The cover is quilted and the thick foam cushion is inside that. No, it does not have an inside waterproof cover. Yes it does; however, it is on one side only! Does the bed have any plastic type product under cover that would cause the bed to make a crinkle sound when layed on, or is it quiet? BEST ANSWER: It has a plastic liner in the inside on the bottom, but it is VERY quiet. Didn't even know it was there until we had been using it for a couple of months. Noticed the dog wasn't always laying on it when it got hot and then discovered I inadvertently had the plastic side up. Flipped it over and she went back to laying on it except in the hottest days. The bed is quiet. I was a little disappointed with how thin the bed is given the price. It does not provide much support or cushion. what fabric is used for the cover? Very soft, almost like a faux suede. Tag says microfiber. A micro fiber, I believe, should say in the details. Is this bed made in the USA? What is the difference between memory foam and orthopedic dog bed? BEST ANSWER: Tag says manufactured by Carolina pet Co. Then it mentions the cover and says made in China. So not entirely made in USA. Maybe put together in USA? I have a 10 year old boxer bulldog and he loves it. The memory foam part contours to shapes (dogs/people). Whereas stiffer orthopedic foam is nice but doesn't contour. This is the nicest bed. The foam is made in the USA but the cover is made in China. Regular memory foam tends to be thinner and more porous. 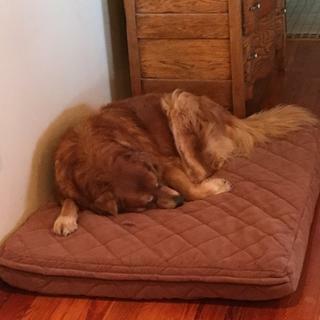 Orthopedic dog bed uses a thicker and more dense type of memory foam made from polyurethane, which helps relieve pressure on joints and is beneficial for my senior dog with hip dysplasia. If the cover is made in China then it is not "Made In YSA now is it? "Manufactured in the heart of the textile industrial corridor of South Carolina we combine domestic production with a global supply chain to bring American pets, products made by American workers." There are 5 photos of colors, but only 4 colors from which to select. I want to be sure that I order the right one. Is the 4th picture (brown) = "Caramel"? Thanks very much! BEST ANSWER: The 4th picture in, is the color Chocolate. do you offer replacement covers for this product? BEST ANSWER: Unfortunately we do not carry the replacement covers.